Tiphanie Veninga :: Lane Enterprises, Inc.
There’s something to be said for recognizing what job is going to make you the happiest. For Tiphanie Garcia, it took a few years before she realized that McDonald’s — her first job — was the one for her. 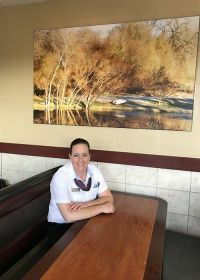 Tiphanie, who is the General Manager at our newly purchased Kingman, KS, restaurant, started working for McDonald’s in Mount Vernon, MO, when she was 16 years old. Tiphanie progressed quickly from crew to a shift manager, eventually becoming the General Manager. After a short time, she moved to Arizona, where she obtained a bachelor’s degree in criminal justice and began working as a prison guard. In 2013, Tiphanie moved back to Kansas and decided to make a shift away from law enforcement and found her way back to McDonald’s. When the Lane’s took over ownership in mid-October, the restaurant immediately changed and even attracted the attention of new and previous customers. Personally, Tiphanie is thrilled about the new owner, especially the support she has received from Joe Lane, the Owner/Operator, and Supervisor Alexis Bennett.